om Reverence to the Guru, the Buddha, and the Bodhisattvas! I respectfully prostrate and take refuge at the stainless lotus feet of the Dharma lords, the excellent masters, the manifest forms. Please grace me at all times with your great love. I bow at the feet of the permanent, stable, eternal, precious Dharma lords, masters possessing the four reliances, who spontaneously perform all-pervading enlightened activities, and clarify the absolute, the unconfused definitive teaching. I bow at the feet of the masters who carefully teach that all conditioned entities are impermanent, unstable, changeable phenomena —like a mountain waterfall, like a cloud, like lightning, and like dew on a blade of grass. I bow at the feet of the masters who teach that the nature of suffering is the same for the entire three realms —like being caught in a pit of fire, or a vicious viper’s mouth, or like a bee circling inside a pot. I bow at the feet of the masters who teach that people who cling to the impure body as pure are the same as ignorant children who like and desire a vase of vomit beautified with ornaments. I bow at the feet of the masters who cause sentient beings who feel attachment for cyclic existence to feel revulsion and sadness toward the impermanent and the impure, and teach them the four truths for entering the path of empty and peaceful selflessness. I bow at the feet of the masters who teach that all phenomena merely arise from conditions, without any self, agent, soul, or creator, and are like a dream, an illusion, a mirage, or an echo. I bow at the feet of the masters who clearly teach that objects appear to be external, but are merely the habitual propensities of mind, and that even mind, intellect, and consciousness are mere names, mere designations, just emptiness like space. I bow at the feet of the masters who teach that the aggregates of form, sensation, perception, volition, and consciousness are like foam, water bubbles, an illusion, a mirage, or an echo, and who teach that the sensory bases are the same as an empty town, the senses the same as vicious vipers. I bow at the feet of the masters who teach that all the phenomena of existence and cessation are birthless and ceaseless, free from going, coming, and remaining, without extremes or center, each and all empty of essence. I bow at the feet of the masters who teach that, like a lamp within a vase, the treasure of a pauper, or the unborn princely son of a destitute woman, the Buddha essence, luminosity, or the truth form exists within the sheath of the relative, incidental aggregates. I bow at the feet of the masters who carefully distinguish, “All imagined and dependent phenomena are nonexistent, but the fully established true nature is never nonexistent,” teaching what transcends existence and nonexistence, and eternalism and nihilism. I bow at the feet of the masters who teach, “All relative phenomena are merely the dependent origination of cause and result, but the self-arisen absolute transcends dependent origination,” teaching the difference between primordial awareness that arises from conditions, and what is self-arisen. I bow at the feet of the masters who teach, “All outer and inner phenomena are merely the confusing sphere of ignorance, but the other is the true nature, self-arisen primordial awareness,” drawing the distinction between consciousness and primordial awareness, cyclic existence and cessation, and the two truths. I bow at the feet of the masters who teach the intent of the Dharma wheel of the four truths, the Dharma wheel of no characteristics, and the Dharma wheel of certainty in the absolute. I bow at the feet of the masters who, with the nectar stream of the three wheels in sequence, clean the three coarse, subtle, and extremely subtle stains to obtain the sublime jewel of the truth form separated from stain. I bow at the feet of the masters who teach people who accept external objects that everything is mind, who teach the middle way of no appearance to those who are attached to mind, and who teach the Great Middle Way of perfect appearance to those who accept no appearance. I bow at the feet of the masters who teach inferior disciples the Dharma of cause and result, who teach those who adhere to existence that everything is empty, and who teach the Buddha essence of luminosity to those who accept nothing. I bow at the feet of the masters who teach the vehicle of the hearers to people of inferior faculties, the vehicle of solitary realizers to those of middling faculties, and the sutra and mantra paths of extraordinary cause and result in the sublime vehicle to the great. I bow to you who care for disciples with the three wheels in sequence, and especially the swift path, just as parents care for infants, adolescents, and young adults according to their development. I bow to you who also teach the three wheels in sequence, and especially the swift path, according to the character of disciples, like assigning work to an inferior, middling, or superior child, according to character. 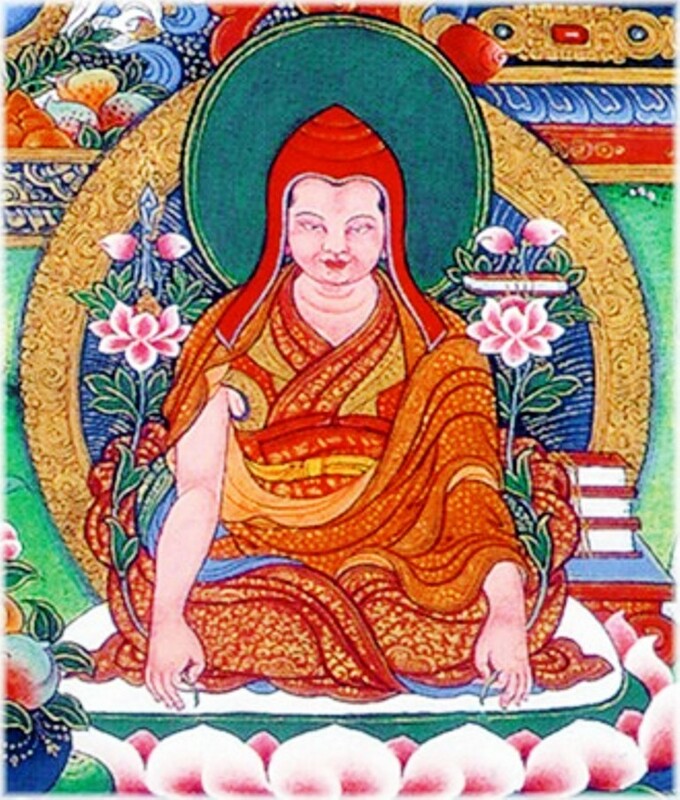 I bow to you who teach that the Buddha Dharma of the three wheels in sequence, and especially of the swift path, is to be approached in succession, like climbing to the top of a three-storied mansion. I bow to you who teach the cleansing of the Buddha essence by the three wheels in sequence, and especially by the swift path, just as three layers of stain on a precious stone are cleansed in succession by a jeweler. I bow to you who teach that the Buddha essence has another cause and result. The other cause is the luminous form of emptiness, and the other result is immutable great bliss, spontaneously self-arisen. I bow to you who teach that many various names —such as Secret, Great Secret, Element of Space, Universal Matrix, Source of Phenomena, Lotus, Womb, Lion Throne, Lady of Selflessness, and Fierce Sublime Ignorance— have one meaning: emptiness. I bow to you who teach that the many names of precisely that —such as Indestructible, Drop, Life-Drinker, Gathering, Restraint, Wonderful, Great Compassion, Primordial Buddha, and Enlightenment Mind— have one meaning: great bliss. I bow to you who teach that many names —such as Priest of the Buddhas, Life, Ruler of Time, Closed Circle, Indomitable Hero, Destroyer of Illusion, and Hidden Assembly— have one meaning: unity. I bow to you who teach that united, indivisible, of one taste, indestructible, self-arisen primordial awareness, the Primordial Buddha, is present in all as suchness with stains, like the all-encompassing sky, and exists as the universal ground. I bow to you who teach the swift yoga, the perfection of wisdom, the ultimate yoga, and the meditation of the great seal with its branches as the path, the method for freeing precisely that from the sheath of the stains. I bow to you who teach that, by the sublime method of the path, what is present as the ground is merely actualized as the result, a stainless thusness with all stains removed, like the sky free of clouds, dust, smoke, mist, and eclipse. I bow to you who teach that the assembly of the non-conceptual primordial awareness of immutable luminosity destroys the sheath of stains on self-arisen primordial awareness, and that the absolute truth form accomplishes excellent benefit for oneself. I bow to you who teach that a special feeling of great love for those wandering without understanding creates the assembly of merit that accomplishes benefit and happiness, fully produces the excellent, relative forms and accomplishes excellent benefit for others. I bow to you who teach that, after fully perfecting a sea of prayers, fully maturing a sea of sentient beings, and fully purifying a sea of pure lands, one dissolves into the culmination of perfection. I bow to you who teach that, because of prior impetus, benefit to others will spontaneously occur in all directions, at all times, without effort and thought. I bow to you who teach that the ultimate Dharma wheel is the final wheel, the ultimate vehicle is the great way, the ultimate great way is the vehicle of the essence, and the ultimate essence is great bliss. I bow to you who teach that the ultimate teaching is the great way, the ultimate great way is the swift path, the ultimate teaching in the swift path is the Kalachakra, and the ultimate Kalachakra is bliss and emptiness. I bow to you who teach that the ultimate view is the great middle, the ultimate great middle is birthless and free from extremes, the ultimate freedom from extremes is natural luminosity, and ultimate luminosity is great bliss. I bow to you who teach that the ultimate view is emptiness free from extremes, the ultimate emptiness is apprehensible emptiness, the ultimate conduct is great compassion, and the ultimate compassion is non-apprehending. I bow to you who teach, for the benefit of ultimate disciples, that the ultimate initiation is the transcendent, the ultimate realization is the definitive meaning of the completion stage, and the ultimate attainment is the great sublime attainment. I bow to you who teach that the ultimate assembly is sublime natural luminosity, the ultimate deity is the body of the primordial awareness of bliss and emptiness, the ultimate seal is the great seal of luminosity, and the ultimate mantra protects the mind. I bow to you who teach the complete, ultimate Dharma of the ultimate ground as thusness with stains, the ultimate path as the six-branch swift yoga, and the ultimate result as the thusness of the separated result. By this virtue, may I and all sentient beings actualize the separated result of the absolute truth form, and, with the produced result of the two relative forms, work for the benefit of others for the duration of cyclic existence. For as long as that has not been achieved, by means of the three wheels in sequence, and especially the swift path, may I always be enthusiastic in cleansing in sequence the stains on the Buddha essence in myself and others.